I was following the live tweets coming from Saturday’s debate among the Labour leadership contenders. I could sympathize. Many moons ago I was quizzed at a couple of public events by Simon Fanshawe, the chair of Saturday’s event. He’s not backward in coming forward with the difficult question that gets to the heart of the matter. I think I’ve now just about recovered. This is already shaping up to be a peculiar contest. Dan Jarvis disappeared from the running before it even got started, but nonetheless has raised his profile enormously in the process. Chuka Umunna dithered a bit, then arrived and departed before the whole carnival really got going. Who knows what the full reasons for his exit were. I can imagine that that the level of press intrusion is absolutely hideous, but it seems odd that it took him by surprise in the way he suggested it had. With those two candidates out of the running I’m not sure there’s much to set the pulse racing. If the candidate who came distant fourth in the 2010 leadership elx is now the favourite that’s surely a pretty desperate state of affairs. Clearly, that’s a reference to Andy Burnham. It seems to me rather self-evident. If your favourite this time around came a distant 4th to someone who has just been trounced in the polls then things aren’t looking all that great. Unless there is an argument that not only was Ed Miliband’s election a mistake but also that David Miliband and Ed Balls were also somehow erroneously preferred to Andy B. Yet I was taken to task for that tweet by one of Labour’s Twitter contrarians who stated that my criticism was “daft” and that it is “surreal some think no experience is best in politics”. I’m not sure I said anywhere that what was needed was someone with no experience. And clearly none of the candidates – including Andy Burnham – has the experience that matters: none has been party leader. But let’s leave that to one side. It depends on whether Labour are looking for a leader for the next couple of years or someone to lead them into the 2020 General Election. I guess if Andy Burnham has as yet undiscovered hidden depths in his ability to inspire the party and give it a sense of direction then he may be the man for the next couple of years. But I can’t see how he can be seriously considered for the run up to 2020. I’ve nothing against the guy, but the Conservatives will have no hesitation in tearing in to his record. They’ll just point to his tenure as Health Secretary and keep saying “Mid Staffs, Mid Staffs, Mid Staffs” – something to which he’s never yet come up with a particularly good response. And when they’ve done that they’ll point out he was Chief Secretary to the Treasury during the Financial Crisis – the period when Labour ran up the bill that everyone seems so keen they should apologize for. I’m not saying it’s right. I’m not saying it’s fair. But that’s what the Tories will do. 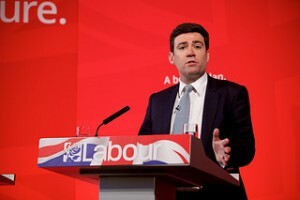 He was succeeded as Chief Secretary by Yvette Cooper, one of the other current contenders for the leadership. So she’s possibly in line for the same treatment. Cooper’s current strategy seems to be to swing dramatically away from Ed Miliband’s position on the economy: where he was seen as anti-business, Cooper seems keen to be seen as almost implausibly pro-business. This stance has got an uber-Blairite feel to it and I’m not sure it works. I’m not sure it works because, first, it doesn’t come across as particularly authentic and, second, if what the population wanted was a massively pro-business party with a strong authoritarian streak – and everyone agrees Cooper has a strong authoritarian streak – then they might as well vote Conservative. It seems Burnham is also positioning in a way that suggests he wants to outflank the Conservatives from the right on topics like immigration. Personally, I think the Cooper diagnosis on the economy is mistaken anyway. Ed Miliband made a strategic error in drawing the distinction between “predators” and “producers” because it allowed him to be portrayed as anti-business. But his diagnosis wasn’t incorrect. There are companies that make a vastly positive contribution to the British economy and to our society. That contribution should rightly be celebrated. But equally it would be foolish to deny that there is much problematic behaviour in the corporate sector, be it asset stripping rather than creating real value or exploiting consumers who are vulnerable or lacking information. We only have to look at the emerging concerns that a new wave of boiler room scams is heading our way in response to the liberation of pensions to see an example of this. Similarly, Miliband was not wise to choose a price freeze as the way to address the problems with the energy market. But he wasn’t wrong to say that the energy market has problems. It would have been possible to frame Miliband’s business agenda in a way that could be seen as broadly positive, or at least not anti-business. But I’m not sure it was possible for Miliband to do it. Burnham and Cooper are, according to the bookies at least, the front runners for the leadership. I can’t see either of them being effective against the newly emboldened Cameron Conservatives. They both have too much of an association with the last Labour government. And they can look nothing other than disingenuous as they try to dissociate themselves from the Miliband agenda that until two weeks ago they were lining up behind. Some of the policy positions being articulated are no doubt genuinely held – we all know that Burnham can barely mention the NHS without practically welling up – but there is also a sense that there is plenty of triangulation going on as well. Attempts are being made to appeal simultaneously to the various stakeholders who need to feel loved – the unions, the ex-Labour UKIP voters, the aspirational swing voters, and so on – even though they may be perceived to be looking for very different things from the party. Some of this is rather unedifying. Yet I’m not sure that any of the other candidates are going to be any more convincing, and I’m not sure they’re going to get much of a look in anyway. It feels to me like Labour need a fresh start. There needs to be a new vocabulary and someone needs to be able to communicate authentically using it. I’m not sure it is a matter of left versus right. Ed Miliband wasn’t particularly left wing. His problem was that he wasn’t particularly convincing and he wasn’t carrying people with him. The vocabulary may be one of “aspiration” – but that terms has to be given some content before it really starts to signify something. If it means no more than endorsing and legitimising individual material acquisition then that will appeal to some – quite possibly many – but it isn’t going to bring many people back from the Greens. In the background there may well be triangulation, but if we can see the cogs turning as the leaders work out what the right thing to say is at any one time then it will continue to come across as too calculating. Someone the other day said that Labour might be better looking for a John Smith rather than a Tony Blair at this stage. Someone solid to lead the party forward during a difficult time, but who would hand the leadership over to a charismatic leader – hopefully not in the same circumstances as John Smith did – in the run up to an election, when the party is already on the up. It seems to me there could be much merit in such a two phase strategy. The pool of candidates in a couple of years time might well look very different and more inspiring. The someone I mention in the last paragraph and couldn’t bring to mind when I was typing the post was Nick Barlow here. I fear I’m going to be boring and agree a lot with you. 1) Part of this election loss came out of letting the government set the agenda after the election without resistance. Has to be worth trying to do better this time. 2) Between now and the EU referendum, the Tory majority is relatively small and the focus will be on various fractious EU related issues. There are plenty of tactical wins out there if Labour can focus on opposition life. At the same time, I think there’s clearly a set of issues to address in the longer term. Miliband (it seems to me) had the right instincts in trying to find a set of issues that cut across those 4 constituencies. But he didn’t have the charisma to pull it off, I think he made some key mistakes early on which helped the Tories set the tone on austerity too. And while I don’t agree with Jon Cruddas on much, (the interview with him in The Guardian is interesting) I think Miliband and team were fooled by the polls into playing for a narrow win. And that means they did what I think many commentators are doing now, which is underestimate how much the media environment and even the culture favour the Tory message at the moment. The word from the polls (I have a few contacts in the market research community) is that it was less about “Shy Tories” and more that 2010 was an anomaly in youth turnout. Had youth turnout matched 2010, we’d probably have the hung parliament we expected. My catchphrase on this is “Generation Buy To Let” voted, “Generation Rent” abstained. This suggests to me two issues that anyone trying to create something across the 4 constituencies in the article needs to think about. (1) How do you connect with the youth vote? Groundwork, social media and more. It’s a lot of hard work – but the one reason it should be interesting to anyone in opposition (so LibDems too!) is that this is a generation relatively less committed to the newspapers. There is potential in this arena to have a different debate. (2) There has to be a longer term effort to address the culture changes wrought by the Thatcher/Major/Blair era. Thanks for your megacomment. Lots in there to think about. Your point about the possibly waning power of conventional newspapers offers a glimmer of hope to those of with progressive aspirations. You are right about the need to think long term. The academic literature is replete with accounts of the rise of “neoliberalism”, which was thirty years in the making. Articulating any sort of sustainable alternative, one would imagine, will take at least as long – and possibly longer because it will be seeking to challenge privilege rather than further ingrain it. One lesson from the history of neoliberalism is that it wasn’t politicians/political parties that made the initial steps. It was intellectuals and think tanks. It seems to me there is merit in reflecting on that further. The issue of preference-shaping versus preference-accommodation is key, as someone pointed out to me on Twitter the other day. The Labour party has tended to be driven by preference-accommodation – we’ll meet the voters wherever they are, even if that means edging ever further right. There is less concern for preference-shaping. But it may be that preference-shaping isn’t going to happen through a political party in the first instance. Rather the discursive context needs to shift and the party/parties then need to be seen to respond to that – rather than the other way around. That may well bring in your points about alternative communication channels/social media etc. Haven’t really thought that through. But it has got to be at that level that change is going to come, if it’s going to come. I’m glad to provide some food for thought. You do that a lot in many of your posts, so it’s nice to return the favour. I do agree that preference-shaping isn’t going to happen in a political party in the first instance. As is probably obvious from the size of my comment, I’d be really interested in a conversation amongst intellectuals and think-tanks that looks to the longer term. I’ve long held the view that we need a long term effort to a new direction away from neoliberalism. (My own specialism is not politics – it’s culture – but I’m outside academia these days.) Perhaps this election result is nagging at me that it’s time to get started. What I worry about is that the non-party-focused-progressive think-tank scene doesn’t seem that strong. I don’t really know how to get this conversation started or hosted – or even how to get involved. This is not about the original post, but seemed like the best way to bring something to your attention. Hi, thanks, I’ve just had a look at Hutton’s piece. I’m not sure exactly what he’s referring to there. It might just be a reference to the outcomes of the Mortgage Market Review and the powers given to the Financial Policy Committee. Although the focus of the FPC’s attention has been on macroprudential regulation I believe they have also been given the power to set max LTV and LTI ratios. If that’s the case then they have some significant levers to pull if they feel the need.